Many of us struggle this time of year to find a way to stay true to our vegan commitments while not perpetuating the idea that being vegan is a sacrifice doomed to kill the fun of holiday traditions. 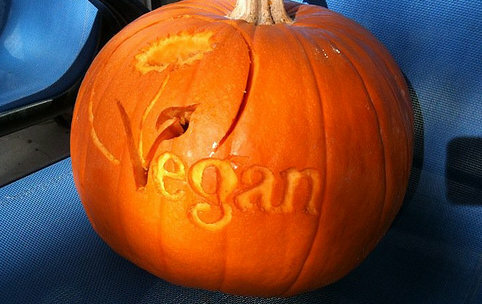 I will be the first to admit that Halloween has been one of the most intimidating holidays to me since becoming vegan -- hundreds of kids running around my neighborhood demanding candy? I am always at a loss of what to give them. When they hold out their sacks full of milk chocolate and sugar, I feel overwhelmed with guilt about contributing to their future cavities and health issues. Since healthier homemade treats will be tossed by most parents right away, I’ve thought up some non-edible alternatives to candy this year. Stickers: Stickers often come in packs of many, so they can be a pretty cheap alternative to candy. You can go with Halloween themed stickers, or any other theme you can dream of (animals, trucks, pirates, flowers, etc.) To add more fun, you can even find stickers that are glittery, scratch-and-sniff, or glow-in-the-dark. Small toys: You can find small toys in bulk for cheap at a dollar store or party supply store. Consider small containers of Play-doh or bubbles, glow sticks, yo-yos, bouncy balls, or kazoos. When choosing toys avoid ones with small parts that could become choking hazards. Drawing or coloring supplies: Find Halloween-themed pencils, or small packages of crayons. Many places will even have small Halloween-themed coloring books for cheap. Temporary tattoos: You can find these in bulk at a party supply store. You can find Halloween-themed ones or many other age-appropriate styles. As with stickers, you can also find these in glow-in-the-dark or glittery versions to add more fun. Kids won’t be disappointed by stickers or toys. In fact, they will be excited about them, as they will often last longer and provide more fun than candy. Albany, NY Andee has been vegan for 15 years. She is a full-time freelance writer, blogger, and mama to two sweet and feisty cats, Pippi and Nora. Andee also shares her time and love, volunteering at a local cat shelter.